Between my well-documented love for sharks and my famously vegetable-less diet, a recent story about a “vegetarian shark” was destined to be e-mailed to me by friends and family. 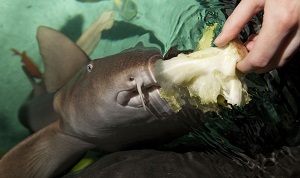 For those of you unfamiliar with the story, a captive nurse shark at an aquarium in the United Kingdom has been eating lettuce and celery, and refusing to eat normal nurse shark food (crustaceans and fish). As a result of this…no, wait, that’s pretty much the whole story. This animal has been dubbed “the world’s first vegetarian shark”, and my twitter and Facebook feeds have been full of people misinterpreting what this means even worse than the original media coverage did. This is not a case of an animal “changing the reputation of sharks worldwide, and in the greenest way possible”, as reported on EcoRazzi. This is not a case of “even sharks realizing that vegetarianism is the most environmentally friendly diet”, as some have claimed. The reality is much more troubling. Following an incredibly traumatic experience (a 2009 surgical procedure to remove a rusty hook lodged in the digestive tract), an animal has radically changed its natural behavior in a way that isn’t healthy. Yes, unhealthy- regardless of your views on the health benefits of a vegetarian diet, I’ve been assured by friends who do eat vegetables that lettuce and celery don’t have a lot of nutritional content. Fortunately, the aquarium staff at the Birmingham Sea Life Centre is aware of this and is working hard to get this animal the nutrition it needs. According to the press release (available online here), aquarium curator Graham Burrows said “we’re having to hide pieces of fish inside celery sticks, hollowed out cucumbers and between the leaves of lettuces to get her to eat them”. One could argue that the fact that the shark is still eating fish (although hidden among veggies) means that it isn’t a vegetarian at all, but that isn’t really the most important point here.